Dr G.D.Pol Foundation Ayurveda hospital has a well established and fully fledged U.G as well as P.G department in Rognidan. The U.G department has a spacious students’ lab, a museum and fulltime staff. This is a BAMS 2nd year subject. In this department we teach the students diseases on the basis of Nidan panchak (Aetiopathological) and clinical presentation. Rognidan-Vikrutividnyan is the foundation of all the clinical subjects. The subject helps you to understand in depth the disease (Vyadhi-vidnyanam) & its pathogenesis (Samprapti Vidnyanam), the art & science of the clinical examination methods (Aatur or Rugna Parikshan Vidhi); the signs & symptoms or clinical features of the disease, the required investigations (Vyadhi pariksha vidhi) & the interpretation of their results as well. The subject deals with not only the diagnosis but also the prognosis (Sadhya-sadhyatwa) of any disease. Thus it renders the student to understand the philosophy as well as practicality of vyadhi-vidnyanam.All these topics are taught according to Ayurvedic as well as modern aspect. Our department has a well established and equipped museum with both microbiological and pathological divisions. Our well trained and highly qualified teaching staff conducts clinical classes with the help of updated imaging technologies. We have a well established central laboratory having facilities for hematological, biochemical investigations and microbiological investigations. Our department is the back bone of Dr G.D.Pol foundation YMT Ayurvedic hospital as we are busy working serving the patients by providing the investigation reports. The Department conducts PG Courese M. D. (Rognidan) since yr. 2010 with intake capacity of three scholars per year. Our aim is to teach and prepare a 2nd year BAMS graduate to be an expert in Rognidan- Vikrutividnyan. As Rognidan- Vikrutividnyan is the foundation of medical science, once the student is an expert in this field he will automatically become a superior doctor. Our department strives hard to make the students think, understand & learn the philosophy of Rognidan & Vikrutividnyan. Our aim is that our students should be able to think & explain the etio-pathogenesis (samprapti) of newer diseases, other unexplained & unnamed diseases on the basis of principals stipulated in Ayurveda classics with the help of sound knowledge of “Nidan panchak” & Vyadhi Ghatak. Our students should also be able to explain the Samprapti of each disease with the help of different samhitas. They should undertake a detailed comparative study of Ayurved & modern concepts of disease, pathogenesis & clinical features. They should study & elaborate the Ayurvedic concepts of vyadhikshamatva, dhatwagnimandya etc. scattered in different samhitas. We should instruct them to carry out a balance between modern laboratory techniques for investigations & traditional skills for clinical diagnosis and they should revise the fine skills in modern laboratory techniques so as to become expert in the diverse fields of hematology, pathology, bio-chemistry, microbiology & histo-pathology. Our students should also be well versed in learning other investigations viz. X-rays, U.S.G, C.T. scan, M.R.I., E.C.G., or bedside procedures viz. biopsy, pleural or ascitic tapping, CSF analysis. This knowledge will certainly help them achieve our main aim i.e. to enable them to be judicious in their advice regarding carrying out investigations. They shall also learn the required applied knowledge about the importance & significance of all the investigations & diagnostic procedures so as to inculcate in him the ideal clinical methods to examine the patient & to enable him to communicate with the patient in a lucid manner so as to understand both the patient as well as his disease. We teach them not only the science but also the art of practicing as a humane professional. Thus according to Ayurveda a learned Ayurvedic degree holder, a competent clinician & a successful doctor should not only have knowledge of the diseases but should master Rognidan-Vikrutividnyan as well. We are having a very well equipped teaching pathology lab for students. Almost 50 students can work at a time and each student gets separate microscope to study. Laboratory technicians & one lab assistant are available to help them. Students are regularly encouraged for Group discussions, group presentation of various diseases and systems. 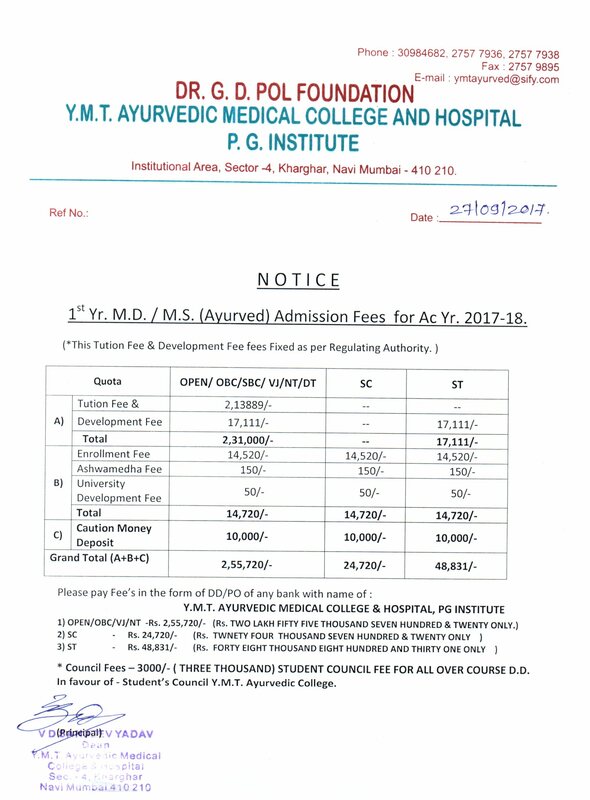 Students they have to mandatorily participate & present clinical cases in intra-departmental as well as inter-departmental levels. Attended Research Methodology Training program at BYL Nair hospital, Mumbai central on march 8th by Dr. Jai Kiran Kini.